"This is Lucky, my hybrid puppy. 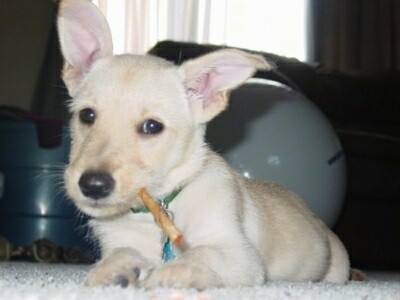 She is 1/2 Scottish Terrier and 1/2 Golden Retriever; a Scolden Terrier. When we first got her (2 months), her ears were completely folded over like a retriever, but as she has gotten older (3 months), her ears now stick straight up like a Scottie. She has the personality of a retriever. She loves the water, and her favorite thing in the world is any stick she finds outside. She is only a puppy, and I have no idea what she will look like when she gets older. She is the best of both worlds." The Scolden Terrier is not a purebred dog. It is a cross between the Scottie and the Golden Retriever. The best way to determine the temperament of a mixed breed is to look up all breeds in the cross and know you can get any combination of any of the characteristics found in either breed. Not all of these designer hybrid dogs being bred are 50% purebred to 50% purebred. It is very common for breeders to breed multi-generation crosses.